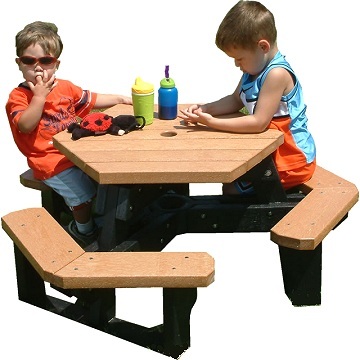 The Recycled Plastic Little Tikes Children's Hex Picnic Table provides children with a great way to relax and get ready for that next romp through the play area! Kids love a table that looks like yours, but is made just for them. The Recycled Plastic Little Tikes Children's Hex Picnic Table brings refreshing appeal and excitement to any area kids enjoy. No splinters, No peeling paint, No sharp edges, and completely Non-toxic. Colors are approximations only. Actual colors may vary. Table Top Length: 25 1/4"
Table Top Width: 29 1/8"